Are you able to think of 6 impossible things before breakfast? If not, you better put this wig on your head and get to thinking of the most outlandish things you could dream up. Think bigger than flying cars and pigs with wings. Dream up Jabberwockies and Queens with extra large heads and cats that can disappear at the drop of a hat! This wig will help you tap into that creative imagination that you've always had. You'll be able to dream up at least 20 impossible things before breakfast and at least 100 before the day ends, and you'll have this wig to thank! 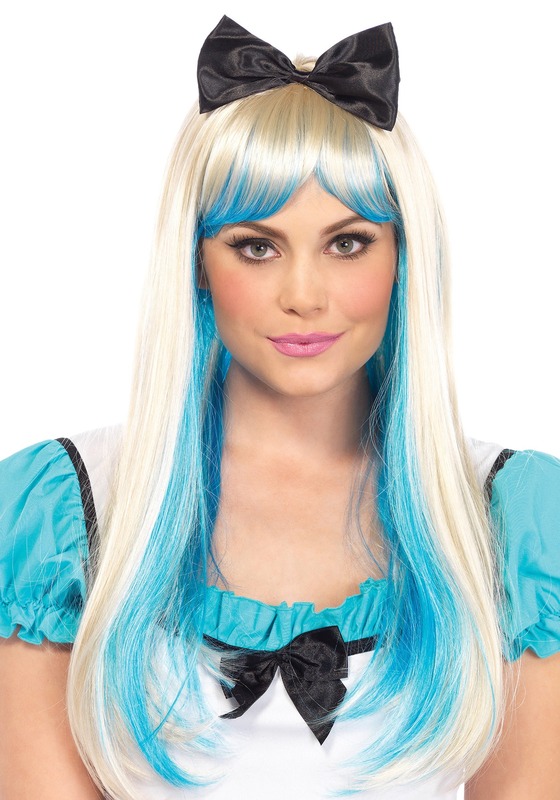 This cool Alice Two Tones Wig puts a trendy twist on Alice's classic blonde hairstyle. A large black bow is fastened into the long platinum blonde hair. This peek-a-boo type hairstyle features bright blue hair underneath so you get a hint of color that will match your Alice dress. You'll like this hairdo so much that you may even consider dyeing your hair like this in the future!